Civil Servant. City dweller. Ultra amateur programmer. Constant learner. Decided on a problem that needs solving at work. Now to determine the solution can be accomplished via python or c# and/or which one I&apos;d rather attempt to tackle it in. ELI5: what is systemd and why do people not like it? I want to improve my (practically non-existent) coding skills in a way that would benefit my current (non-tech) job. I have a basic understanding of Python and C# that I learned via LC101 (launchcode.org), but have forgotten so much due to not continuing to utilize what I learned. In 4 hours 10 minutes, I&apos;m logging out of Facebook and Instagram. Not quite ready to delete my accounts, just yet. Trying to decide on a domain name for my family. This is trickier than I thought it would be. Got a new e-reader this Christmas, but would prefer to buy books from independent bookshops? You're in luck! Most e-readers can open books from other bookshops. You're not stuck with the big monopolies. The Epubizer is here to help. I just reduced my GMail inbox from over 6000 archived emails to just 300 by deleting old chats, and random unnecessary emails (newsletters, old receipts, etc). Is 15 gigabytes of email storage really necessary (for the average user)? Can someone explain what the @mxlinux 18 Continuum is? The thing is, all of us have used federated networks all our lives. Telephones are federated, email is federated, the postal service is federated, telegrams and telegraphs (when they existed) were federated. People understood them and still do, as long as they've been exposed to such things. Everyone knows you can phone anyone even if they're on a different phone company. I think until there is a collapse of SMS as a viable message platform (i.e. it becomes cost prohibitive - pay-per-text, for example), mass adoption of an alternative platform (at least in the US - I understand the rest of the world has already jumped ship from SMS) is unlikely. I think the biggest hurdle is not only convincing your friends/family that "if you want to message me, Telegram is the way! ", but also lighting a spark to get them to use it as their primary mode. Me and my techie friends (of which there are few) might make the jump easily, and convincing my mom and wife to download and message me through a different app is fine, as well. But to move to a tipping point in which HER friends also use it? That&apos;s tricky. People talk about how SMS is old, outdated, and just generally crap. They say things like WhatsApp and Signal are better alternatives. But are they? At least SMS is somewhat federated, and is an open standard. Is there a federated, open standard SMS alternative with any actual traction that could be (or is on the verge of) being a disruptor? I prefer Chrome over Firefox. Can I post this if I make the recipe available open source? Had a busy Saturday afternoon making Kouign-Amann and empanadas. I&apos;d been using Authy for 2FA because of it&apos;s sync capabilities. Any FOSS options out there? Authy doesn&apos;t have a Firefox extension or Linux desktop option. 2 things I&apos;d really like to have. 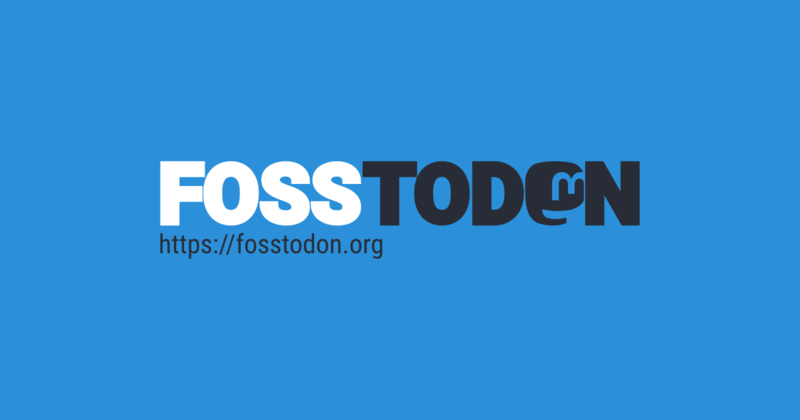 What does the Venn Diagram of linuxrocks and fosstodon users look like? The office is about to hate me. I don't say a place got "socially engineered"
That phrasing, while clinical and professional, hides some of the simplicity of what happened. I say an attacker "called up and asked nicely"
"The company was breached after a hacker socially engineered a support rep" vs "The company was breached after a support rep gave passwords to someone who called up and asked nicely"